Its a new year once again according to the calendar and the winters are at their peak and no matter how much I avoid not being out during these days I somehow passed one of the longest night last week at a place that to me often brings a feeling of deja vu - RAILWAY STATION. A place where people (and even animals) from different strata of the society (and even who are outside of what we call society) come together, see each other, think about each other and make views about each other according to their own mental make up and prejudices. One can view different sets of personalities, dressing sense and different habits and behaviours. Our subconscious mind is always analyzing the stuff constantly developing around us. If one's senses are active and working one cant help but retain his or her observations in the mind for future reference. 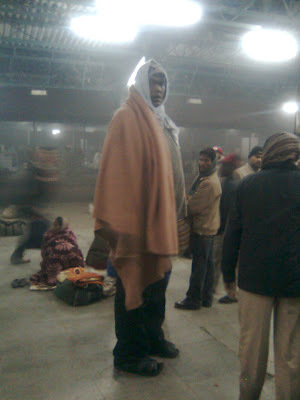 So I was there on a chilly night, the temperature falling to the season's lowest as I was told by somebody. The developing fog was clearly visible. The train was to arrive at 2220. Initially it was late by 1 hour. Then it was announced that it will be late by 3 hours. When you expect something and you also have a feeling of fear in you that it will be a one time opportunity (in my case boarding the train) what do u do? STAY AWAKE. And that was what I was struggling to do. Cups of tea and coffee which we like to have during this kind of weather had by now lost their relevance. Feeling a little shivery I vowed to find out the brand of my inner vest once I reached home and never to buy that one again in my life. At around 3.30 the ting tong lady announced that the train is expected to arrive shortly.It was during this time that I heard some uproar some distance away. If the reason had been something else I would have gone there to actually know what was happening but this time I just moved my head in the direction from where I heard the noise and literally I stood still for a few seconds. The first question that crossed my mind was Who is He? Certainly not a human being. But he had all the necessary functions to be called one. And Oh! He is walking too! How is he doing it? Long and large hands and legs. A large big face. Its really an extrordinary thing to watch a person as tall and large as He was in real life. How does He handle himself?. I started walking and went a little close to him. Wanting to capture the rare opportunity I took out my mobile and focused it on him. He showed an angry face when he saw me taking his picture. Realising that I immediately kept my mobile inside. The people nearby asked him some questions but they fell on a deaf ear as he sounded illiterate and did not respond much. Although I did thought of taking a snap with him but could not muster the courage to do so. By this time my sleepiness had gone and I heard the horn of the train. In the picture above compare HIS height with the people standing nearby. But as they say Seeing is Believing.